Every summer, thousands of South Koreans, Chinese and Japanese visitors travel to Jeju Island to enjoy its natural bea uty and coastline. Some activists are trying to get visitors to see other areas that explore the island's history, and remember the victims of anti-communist killings, which began before the Korean War. Jeju Island is known as the 'Hawaii of Korea.' It has numerous waterfalls and natural wonders. Many visitors remember seeing fields of yellow canola flowers and the bright blue of ocean water. But 70 years ago, Jeju was the place where communist supporters launched violent protests against South Koreaâs new government. The protest movement grew into a separatist rebellion. Pro-communist demonstrators held protests to oppose a vote set for May 10, 1948. The election results would confirm the division of the Korean peninsula between communist forces in the North and the non-communist South. On April 3, 1948, rebels attacked police stations on Jeju, killing some officers. The r ebels also burned voting centers for the May 10 vote. The government in Seoul declared military rule to stop the unrest. Thousands of police officers and pro-government militias from the mainland took part in a violent suppression of the protests. The operation lasted until the unofficial end of the Korean War in 1953. The report found 30,000 people were killed in the violence. That number represented 10 percent of the islandâs population. "People were killed without reason,â said Hong Chun-ho, an 81-year old survivor. âAnyone could lose their life. Whether or not, it was a baby, disabled, pregnant, or elderly, there was no exception. They killed anyone that came into sight," he said. Victims' remains in Darangshi cave. Today a citizenâs group operates a business in Jeju called Dark Tours to help visitors better understand the island's sad history. The group wants to call attention to the South Korean governmentâs involvement in the killing of thousands of people. We must âdeliver the message that we will no longer keep silent against the state violence and that we won't let this happen again," said Baek Ga-yoon, a representative of Jeju Dark Tours. The tour group takes visitors to see where executions reportedly took place and the grounds where many bodies are buried. 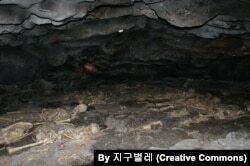 It also shows them caves where villagers would hide from police and military forces. Critics of the South Korean government&# 039;s involvement in the Jeju conflict also hold the United States responsible for what happened 70 years ago. They note that the new South Korean government was a U.S. ally. They accuse the Americans of either directly supporting or permitting the attacks on pro-communist activists. The U.S. military has denied any involvement in the crimes committed on the island. Some South Koreans suspect that the tour group is not about understanding the past, but about criticizing U.S. involvement in the country. Kim Kwang-dong works as a security expert at the Nara Policy Institution in Seoul. He says the education and tours dealing with the April 3rd incident could be aimed at providing negative information about the U.S. military and work against the alliance. He fears this could lead to âthe withdrawal of U.S. Armed Forces, which would be very mistaken." So neither the Jeju tour nor the areas marking the tragic history of the island, have become popular tourist stops. The Jeju Provincial Tourism Association reports that in 2017, only 2.3 percent of Koreans visited the island for cultural or historical education purposes. 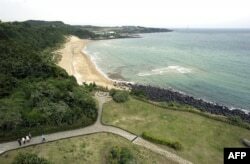 FILE - An ocean view from a bedroom at the Seogwipo Hyatt hotel is seen in this April 26, 2002, photo. The violence that took place on Jeju Island is a divisive issue in South Korea. Some conservatives argue the killing of innocent civilians was justified to prevent the spread of communism during a time of war. Others note the atrocities were committed by government forces. They say the people of Jeju were freedom fighters who opposed the division of the Korean peninsula. For many ye ars, the South Korean government suppressed and restricted information about Jeju's history. People who wrote about the killings were imprisoned. Some children and grandchildren of Koreans involved in the unrest report they had difficulty finding jobs. In 2003, the Korean government apologized for its part in the violence. The families of the victims have demanded payment for damages. This year, South Korea's President Moon Jae-in expressed support for reconciliation through discussions and education. âThe spring of Jeju will blossom like a full bloom," the President said at a memorial ceremony earlier this year. VOAâs Lee Yoon-jee reported this story. Susan Shand adapted it for Learning English. The editor was George Grow.